Are you sure you’re building the right products? Are you sure you have processes in place to bring winning products to market ahead of your competition? The world is loaded with resources to help you make smart decisions about product direction, development, and management. 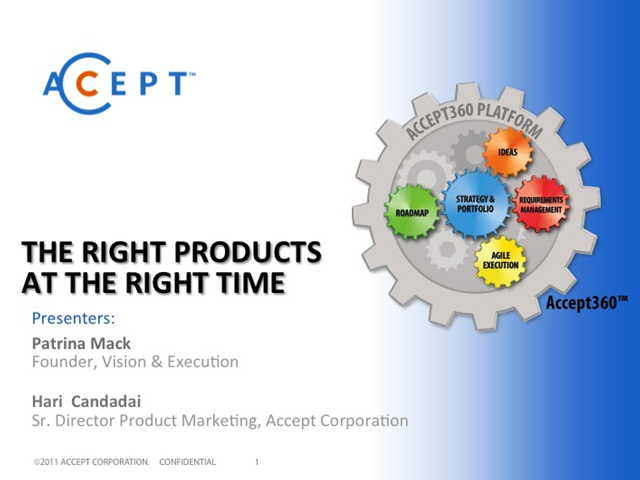 Join Patrina Mack, Managing Partner at Vision & Execution, and Hari Candadai, Sr. Director, Product Marketing at Accept Corporation for this best-practices discussion on designing products that customers want, and get them to market quickly! Patrina Mack, Managing Partner of Vision & Execution, consults with established and emerging technology companies in the U.S., Europe, Russia and Israel. Ms. Mack works with clients to optimize their product and business strategy to enhance customer adoption and market penetration. She has more than 25 years experience in business-to-consumer and business-to-business product, marketing and operational strategy and implementation.